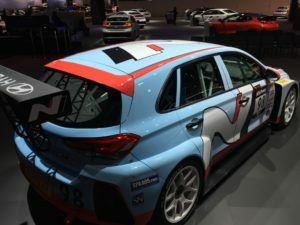 Chicago, Illinois (Feb. 8, 2018) – Bryan Herta Autosport announced a new partnership today at the Chicago Auto Show with Hyundai to field two Hyundai i30 N TCR class sedans in the 2018 Pirelli World Challenge Touring Car road racing series, one of North America’s premier sports car campaigns. The TCR class makes its Pirelli World Challenge debut in 2018 after three years of TCR competition throughout the World. 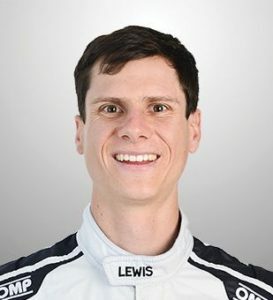 Michael Lewis poses in his new ride for 2018: a Hyundai i30 N TCR class sedan. 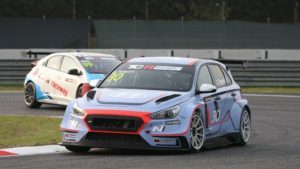 Bryan Herta Autosport, a two-time Indy 500-winning organization, will fine-tune two versions of Hyundai’s i30 N TCR racecars currently available to customers in Europe and develop all aspects of the race team, from vehicles and technicians to drivers, coaching and team management. 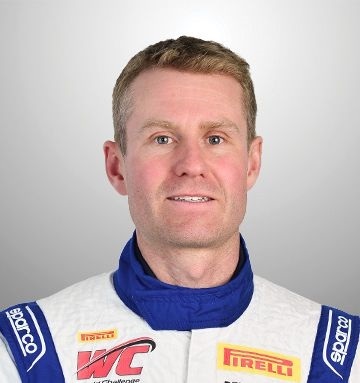 Veteran Pirelli World Challenge drivers Mark Wilkins of Toronto, Ont., Canada, and Michael Lewis of Laguna Beach, Calif., will drive the new Bryan Herta Autosport Hyundai i30 N TCR machines in the 12-race PWC TCR division in 2018. Wilkins, 34, is a multi-time Pirelli World Challenge winner in the GT and GTS categories in addition in other major sports car events, while Lewis, 27, has won four races in GT Sprint and SprintX competition in the PWC series. 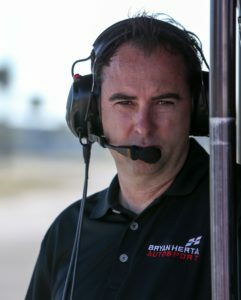 Bryan Herta Autosport, founded in 2009, has grown from a single-car Indy Lights team into a world-renowned motorsports franchise. In 2011, the team captured the 100th anniversary of the “Greatest Spectacle in Racing” with driver Dan Wheldon. In 2016. BHA, partnering with Andretti Autosport, returned to the coveted victory lane at the Indianapolis Motor Speedway in capturing the 100th running of the Indy 500 with driver Alexander Rossi. In addition, Bryan Herta Rallysport made its debut in the exciting Red Bull Global Rallycross Championship in 2015. Announced at the 2018 Chicago Auto Show, Bryan Herta Autosport will join the Pirelli World Challenge this season. The TCR Series, originated in 2015, was marketed as a cost-effective spin-off of the World Touring Car Championship (WTCC), targeted at C-segment hatchbacks production-based touring cars. The title TCR follows the naming convention now used by the FIA to classify the cars that compete in touring car racing. Six doubleheader weekends make up the 2018 Pirelli World Challenge Touring Car Schedule, beginning with Circuit of The Americas, March 23-25. The Pirelli World Challenge Touring Car divisions will compete in six doubleheader weekends (12 rounds total) beginning March 23-25, at the state-of-the-art Circuit of The Americas (CoTA) followed by VIRginia International Raceway on April 27-29, Lime Rock Park on May 25-28, Portland International Raceway on July 13-15, then a visit to Utah Motorsports Campus on August 10-12, and concluding the season at Watkins Glen International on Aug. 31-Sept. 2. Each TCR race will be 40 minutes in length and one rolling start and one standing stand each weekend. The Pirelli World Challenge is a North American auto racing series launched in 1990 by the Sports Car Club of America. It has been managed by WC Vision since 2008, and sanctioned by the United States Auto Club since 2017. The series consists of seven driver classifications and several classes of vehicles, including: Grand Touring, GT Cup, GTS, TCR, TC and TCA. The series frequently races alongside the IndyCar Series on race event weekends. Each Pirelli World Challenge Touring TCR season consists of six event weekends with doubleheader races for a total of 12 rounds. Each weekend has one standing start as well as one rounding start. Each TCR race has a maximum 40-minute time limit. The allowed body styles in this class are coupes, hatchbacks, wagons and sedans. Power output is in the 300+ horsepower range. Vehicle weight varies depending on the power output of the individual drivetrain configurations. Front-wheel, rear-wheel, and all-wheel drive configurations are permitted. Forced induction may be allowed on cars that have forced induction systems available from the manufacturer which do not void the factory warranties. Five years later, Bryan Herta Autosport, while partnered with Andretti Autosport, defied the odds again and won their second Indianapolis 500 with rookie driver Alexander Rossi. In 2015, Bryan Herta Rallysport made its debut in the exciting Red Bull Global Rallycross Championship. Height / Weight: 6’ 5” / 145 lbs. This entry was posted in News on February 12, 2018 .